Part of the issue here is that there is an effort under way to improve the security culture throughout the RAF, tied in with the arrival of F35, RJ and other highly classified capabilities. Witness the profusion of ID lanyards, controls on social media use, etc. The reason to be like that at a training base is precisely that it’s a cultural shift being sought, so the trainees need to be indoctrinated and the staff need not to get ‘lazy’ while away from the front line. I’m not saying that this is anything more than a sticking plaster to make up for the unwillingness to invest in US-style physical security measures, by the way - just explaining why things might seem to have changed. Nothwithstanding the above my sincerest and most heartfelt thoughts are with you at this time. All I can do is reiterate the previous advice, pick the phone up and explain. There is always a way. Take care. Thank you all for your supportive comments. The problem I have already, before I wrote the post, been in touch with the Mess manager and OC GD Flight explaining my position and asking them to get in touch with Stn Cdr/PMC informing them of my predicament and my wife's wishes. Complicated as we do not know names or numbers let alone the date ! I believe this to be the right approach as the Stn Cdr has other priorities at the moment. I once had someone seeking access on the basis that he worked for the RAF News. For ID he produced a driving licence. I refused him access. He had once written an article for them, no way did he work for them. Had he simply asked if hr could have a look he would have been welcomed and escorted. That he tried bluff caused me to check. Nothing new, Honington in the late 1980s had you wearing a pass limiting where you could go at any time. Marham (same aircraft and role in the case of the Tornado) did not. Same at Wyton in the 60's, had to wear a pass limiting access to certain areas. The MOD Corsham mess has got its act together and although I have to renew my passes annually (they also review your membership based on attendance at functions), the application process is easy with the sponsor for membership being the current serving social secretary. Guests were required to get a temporary pass every time they came on site but they abandoned this when they realised that they could not afford the overtime to have people manning the security office at every event and used common sense ie the gate guard has a list of people who are attending the event. Its a real honour to still be allowed to attend the various functions and an e mail thanks to the PMC and members running events always goes down well. A swipe entry with code for the back gate allows me and Mrs bladdered to stagger home late at night!! The system relied heavily on snowdrops and redcaps and others to enforce, and accidents happened. A colleague with a blue [RAF entrance] pass accidentally swapped passes with his wife at breakfast [red, army entrance]] and they both swanned around for the morning. A hasty phone call and they met furtively in Leystrasse to swap. 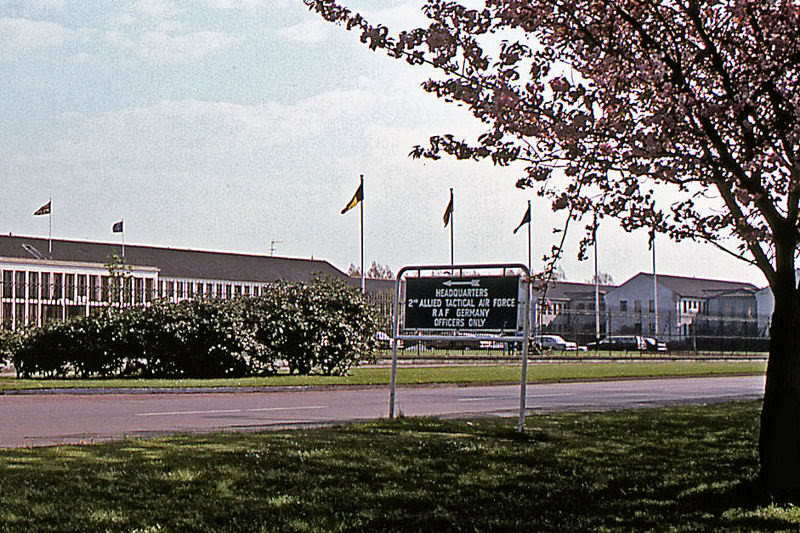 As I remember JHQ Rheindahlen in the early 1970's. I was never sure that I understood public access to the "camp". There were two vehicle access roads post IRA atrocities, essentially from the east and the west. The east access [at least] was always manned by armed military personnel, with ID checked, and random car searches. As to whether genuine German civilians were stopped, I know not. 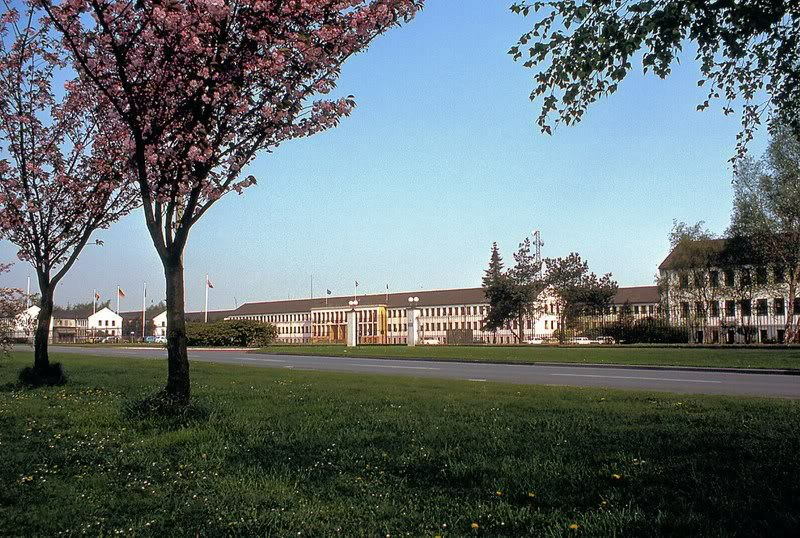 What is certain is that Germans worked in JHQ and in many areas, so had access as necessary. Some houses of historic vintage were owned and lived in by locals. Two Federal German policemen, Tweedledum and Tweedledee, attempted to enforce Federal road laws, such as parking with the flow, and correct use of cycle tracks. Several shops opposite the NAAFI and in the SW extension were German, and there was a German Post Office. In retrospect I suppose that there had to be an agreement with Germany to institute checks on the access roads. Of course access on foot, bike or horse was infinite, including through my back garden gate into the woods. Incidentally, egress as well as access from/to JHQ was controlled, with ID checks and random searches at home time. I never ever used the brown job entrance: apart from anything else it was a million miles away from RAF territory, and JHQ was inadequately signposted so getting lost was all too easy. There were clocks everywhere, sometimes disagreeing by more than a minute or two. ACM Sir Sandy got that sorted in the RAF area within a few days of arriving, and he got rid of the few dogs as well. The army area was definitely doggy throughout, but never a horse [although one colonel was reputed to allow his into the MQ]. Those of us who served there in the 1970 to late 1990s were a golden generation, thrice blessed. Beautifully maintained, medical, recreation, sport, entertainment, security, duty free, cheap petrol ........... and yet my branch was often short of volunteers. Funny old world. JHQ was a security nightmare. There was a German civvy bus route through the camp. The gate guard would check that everyone on the bus had a Personalausweis or passport, and that was it. On it went. Although actually posted there for a year or so, I lived in Willich, having been posted previously in Krefeld and kept my much superior quarter. Thing was, I didn't need a JHQ-specific car pass to gain access to the camp in general. Only to access certain compounds within the barracks; and obviously personal passes for specific buildings/functions beyond my ID card. Not really surprising it was the subject of terrorist attack, and not really surprising that the modern-day MOD is upping security requirements. Not only have they not gone away, they've multiplied in number and variety. Visitors (e.g. aircrew doing AMTC courses) weren't allowed to park their cars in the OM car park, but had to leave them in an insecure area, with the reassurance that it was routinely checked during Plod patrols. As for parking at the AMTC site - forget it. You had to park on some bit of disused runway miles away, so it was simpler to walk from the OM to AMTC, assuming you remembered to leave yourself enough time. A unit so far up itself I have rarely encountered. "A unit so far up itself I have rarely encountered"
Haven't we seen that so often, the proprietorial attitude on some of these little bases which were meant to serve the wider RAF? "You're out of the service now, and this is ours, bu**er off." For me it was Watton. When I was at Honington in the 80's, we had to supply Watton with NCO and Airman/woman cover for 24hr guardroom manning (because they were too busy). We were made to feel most unwelcome even though we were there to cover their duties. I remember the first time I drove up there for the start of my 24hr duty and was ordered to move my car from the empty carpark across from the guardroom because it was for "permanent staff" only. I'm slightly mystified as to why you changed my Post 13 words before "quoting" me in your Post 22. "My" words now seem to make no sense, or at least less sense than the originals. Why?? I do apologise for any offence unwittingly caused. My point was that the rules are there, but of course - as other posters have noted - they can be broken, and the Staish himself is the man to do it. Much good advice here, to which I would add go straight to the Stn Cdr, rather than OC GD or the Mess Manager. Similar issues arose on my Station, and we found a way around them - and that was just after 9/11 too. I wish you well.